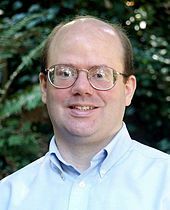 Lawrence Mark "Larry" Sanger (/sæŋɜːr/; born Julie 16, 1968) is an American Internet project developer, co-foonder o Wikipaedia, an the foonder o Citizendium. He grew up in Anchorage, Alaska. Frae an early age he haes been interestit in filosofie. Sanger receivit a Bachelor o Airts in filosofie frae Reed College in 1991 an a Doctor o Filosofie in filosofie frae Ohio State Varsity in 2000. Maist o his filosofical wirk haes focused on epistemology, the theory o knawledge. ↑ Walker, Lauren (16 December 2014). "'Wikipedia for News' Becomes Open to the Public". Newsweek. Retrieved 16 December 2014. ↑ 4.0 4.1 Chillingworth, Mark (November 27, 2006). "Expert edition". Information World Review. Retrieved 2007-03-25. ↑ 6.0 6.1 Roush, Wade (January 2005). "Larry Sanger's Knowledge Free-for-All". Technology Review. Retrieved 2007-03-25. ↑ Sanger, Larry. "Larry Sanger – Education". larraysanger.org. Retrieved 2007-03-25. Wikimedia Commons haes media relatit tae Larry Sanger. Larry Sanger – Sanger's personal wabsteid. User:Larry Sanger – Sanger's accoont on the Inglis Wikipaedia. User:Larry Sanger/Origins of Wikipedia – An essay discussin the oreegins o Wikipedia. Video interview: Larry Sanger talks about Wikipedia and his plans with Citizendium – Maistly in Inglis, wi a German introduction an subtitles. This page wis last eeditit on 13 October 2016, at 15:35.